W miarę jak narasta wpływ sankcji USA na gospodarkę Iranu, po tym jak nawet kraje, które sprzeciwiają się polityce Iranu, podporządkowują się im, znaczenie Iraku dla przetrwania reżimu i gospodarki Iranu także wzrasta. Podkreślając znaczenie Iraku dla Iranu, Sadollah Zarei, który jest w zarządzie redakcyjnym gazety reżimu „Kayhan”, napisał w artykule z 23 stycznia 2019 r.: „Ameryka wyobraża sobie, że osłabi rząd w Iraku, a szczególnie sytuację [irackiego premiera] Adila Abdul-Mahdiego, militarnym naciskiem w północnym i południowym Iraku do punktu, w którym [Irak] nie będzie w stanie unieść ciężaru gorących i rozległych stodunków Bagdad-Teheran. Z drugiej strony, [USA] stworzą [także] niepewność dla irańskiego reżimu w dwóch obszarach irańskich inwestycji. Ameryka wie, że Iran dokonał ważnych inwestycji w ciągu ostatnich 15 lat w prowincjach [Iraku] Sulajmanija, Erbil, Basra, Nasirija i innych i że [Iran] stał się ważnym partnerem Iraku, szczególnie w sektorze energetycznym. Z punktu widzenia Amerykanów, jeśli Iran osiągnie porozumienie energetyczne z choćby jednym lub dwoma swoimi sąsiadami, amerykańskie sankcje nie będą w stanie zablokować tras [eksportu] energii Iranu. Dlatego zerwanie stosunków Iraku z Iranem jest strategiczną potrzebą Waszyngtonu”. Wydaje się, że reżim irański idzie tą drogą, ponieważ irańska hegemonia nad Irakiem pozwoli Iranowi na eksport ropy naftowej przez Irak i zdobywanie w zamian towarów, bez potrzeby banków lub dolarów – obchodząc w ten sposób sankcje USA. Dzięki temu reżim Iranu może nadal istnieć i może kontynuować ekspansję w regionie. To jest kontekst, w jakim trzeba rozumieć niedawną specjalną wizytę irańskiego ministra spraw zagranicznych w Iraku. Wciągnięcie Iraku do kierowanej przez Iran szyickiej osi oporu jest ważnym politycznym i ekonomicznym celem reżimu irańskiego, jak zauważył Sajed Hadi Afachi, irański ekspert ds. regionu, który pisze komentarze i analizy wydarzeń dla stron internetowych identyfikowanych z Korpusem Strażników Rewolucji Islamskiej (IRGC). W wywiadzie z 18 stycznia 2019 r. dla agencji informacyjnej Mehr, Afachi analizował iracka wizytę Zarifa i powiedział: „Irak jest uważany za bardzo ważny kraj dla Iranu pod wieloma względami i może wzmocnić front oporu w tym regionie. Dlatego jesteśmy tacy wrażliwi na Irak i dlatego nie wolno nam pozwolić, by kontrola tego kraju była w rękach Ameryki, reżimu syjonistycznego i pewnych reakcyjnych [państw] arabskich w regionie [aluzja do Arabii Saudyjskiej]. Niestety, nasza działalność gospodarcza w Iraku jest słaba, ale doradcza działalność Iranu [w ramach której] pospieszyliśmy z pomocą irackim siłom militarnym, żeby mogły walczyć z terrorystami w czasie, kiedy była obecność grup terrorystycznych na ziemi irackiej, była pozytywna. W celu ustanowienia strategicznych porozumień handlowych z Irakiem, musimy najpierw przygotować strategiczny plan i dokument. Iran powinien być [krajem, który jest] co najmniej drugi po Rosji w odbudowywaniu Syrii, szczególnie w świetle obecnej sytuacji Iraku, kiedy postępuje z własną rehabilitacją ku stabilności i bezpieczeństwu. Dla nas jednak Irak jest [jeszcze] ważniejszy niż Syria, a to z powodu długiej granicy irańsko-irackiej”. 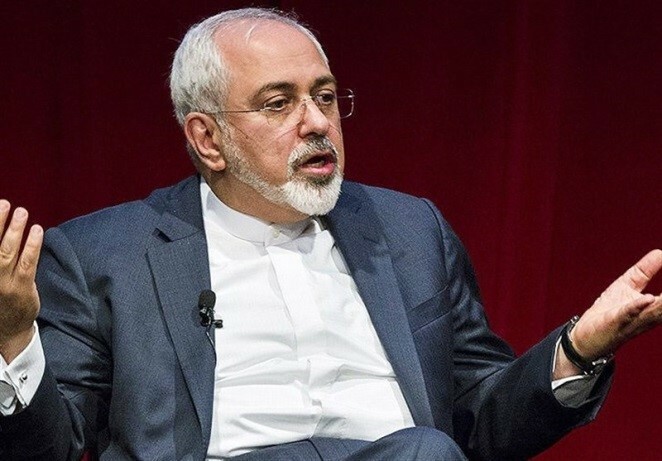 On January 13, 2019, Iranian Foreign Minister Mohammad Javad Zarif arrived in Iraq at the head of a large political and economic delegation for a five-day visit, a few days after a visit there by U.S. Secretary of State Mike Pompeo. 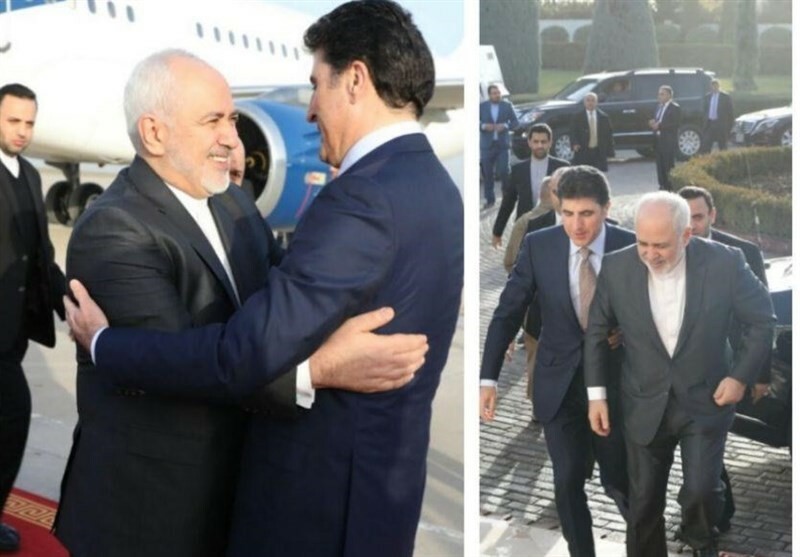 During his visit, Zarif met with Iraqi officials from the political, economic, and religious sectors, including Shi’ites, Sunnis, Kurds, Turkmens, and others. The meetings took place in the capital Baghdad, in the Kurdish cities of Erbil and Sulaymaniyah in northern Iraq, and in the Shi’ite cities of Najaf and Karbala in the south. The aim of the visit, according to the Iranian news agencies Mehr and Tasnim, was, inter alia, to discuss Iranian investments in Iraq, Iran’s participation in rebuilding Iraq, and strengthening Iran-Iraq economic cooperation, in light of Iran’s increasing economic difficulties due in particular to the U.S. sanctions against it. On January 16, in a speech to representatives of Islamic resistance groups in Karbala, Zarif underlined the Iran-Iraq partnership as well as the anti-U.S. and anti-West Iranian revolutionary Islamic ideology that he said Iraq too should take upon itself in order for it to rebuild itself economically and politically. In statements in Karbala to representatives of resistance groups, Zarif, who is perceived by the West as a moderate figure in the Iranian regime along with President Hassan Rohani, underlined how very important Iran considers exporting the Islamic revolution to Iraq, harnessing Iraq’s economy for the needs of Iran’s struggling economy, and expanding Iran’s political influence in the region. 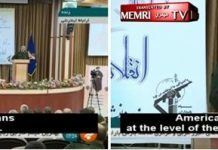 He acknowledged that Iranian forces had fought alongside the pro-Iran Iraqi militias against the Islamic State (ISIS) despite Iranian regime officials’ vehement denials that Iranian fighters were involved in fighting in other countries and their claims that only Iranian advisors were in those countries. Another important element of his statements was the common struggle against those he perceives as the enemies of Islam – the U.S. and the West. „What took place in Iraq in the last three or four years is another sign that if we rely on God, and on our capability, there is a possibility that, under the direction of a first-degree cleric [a reference to Iranian Supreme Leader Ali Khamenei], we can overcome every problem. The secret of America’s pressure on Iran and Iraq in this era is that we and you are acting on this fact, and America greatly fears this and our internalization of it. „Everyone has perhaps heard of the well-known story of the naked emperor. This emperor had no clothes on, and everyone told [him], despite reality, that he was dressed. The emperor accepted this, contrary to reality, until one day a little boy told him that he was naked. This truth shook the pillars of heaven… America wants us to believe that the emperor is clothed even though he is in fact naked, and when someone utters the truth, [America] pressures him so that he ends up agreeing that the emperor is indeed not naked. „The truth is that the era in which America sat in God’s place is over. But few dare to talk about this or to act on it. As long as no one dares to speak out against this, America can control the world without using any force at all, because this method is the cheapest for it. But if someone in this era wants to challenge this illusion, he will be pressured until he accepts America’s might and false control. „American President [Trump] said that [the U.S.] has spent $7 trillion in Iraq with no achievements. In the end, he was forced to arrive at and leave the American air force base in the dead of night. His friends had to turn around when they were only half way to Iraq. All this is evidence of the real [state] of America. Zarif. Source: Tasnim, Iran, January 16, 2018. „Our transgression, and yours – the Iraqi nation’s – is that we are saying that the emperor is naked. We must be prepared to come under pressure for uttering this truth. Whatever the pressure may be, it will not change the truth. „The Americans claim that they defeated ISIS. But we know, and you know, that they never fought to vanquish anyone, and that if America ever did anything in that war, it either helped ISIS or transferred the ISIS men, after they were defeated in Iraq and Syria, to Afghanistan… Therefore, we and you are under pressure to say the opposite of the truth – that the emperor is not naked, or that we think he is clothed – [but] if we [actually] believe this, we will also have to obey America. My dears, the truth is that America’s time is over. This does not mean that America will fall, but that it will no longer be able to lead the world. „My dears! We must see the reality as it is so that we can act on it. Perhaps a century ago all the important events in the world took place in the West; perhaps 20 years ago, the West led or directed everything that happened. But today everything that happens certainly does not happen in the West, and is not directed by it. The obvious example of this is that the American and Russian foreign ministers both announced, in September 2016, a ceasefire in Syria, but two weeks later, the fighting in Syria began again. That is, not everything that America and Russia decide actually takes place. Three months later, Iran, Russia, and Turkey decided that there would be a ceasefire in Syria, and for two years there has been a ceasefire in Syria. America is pressuring the UN to declare that the Astana process has failed, because this process reveals that the emperor is naked. „We, before anyone else, must accept and internalize the truth that America is no longer a superpower that can control [others]. As of today, there is only one superpower in the world, and that is God and those who believe in Him. „This, today, is the truth in the world. Three years ago, I wrote, as a university lecturer, a book titled Transition in International Relations of the Post-Western World. The claim [made in the title] is not mere words, but is scientific reality. In fact, you, the Iraqi people, have proven that it is not America that vanquished ISIS, but [the pro-Iran Iraqi Shi’ite militia] Al-Hashd Al-Sha’bi, the resistance groups, and the Iraqi armed forces. It is funny that they say that America defeated ISIS with [only] 20 [bombing] sorties. The truth is that the regime of America today is a regime that exists [only] in the mind – that is, the world thinks that America still has the glory and the rule. The same truth applies to industry and economy. Where is the world that America rebuilt after World War II, besides Europe? And now it wants to rebuild Syria, Iraq, and Afghanistan. „Any American or even European company that wants to come to Iraq will spend more on security than it will on the [rehabilitation] project. But any Iranian company that wants to work in Iraq will not only see its maximum outlay fall, but it will be working out of love for the Imam Hossein. Zarif is received in Erbil by Iraqi Kurdistan (KRG) Prime Minister Nechirvan Barzani. Source: Tasnimnews.com, January 15, 2019. Kayhan (Iran), January 23, 2019. Mehrnews.com, January 15, 2019; Tasnimnews.com, January 17, 2019. In fact, there has been no ceasefire in Syria since Syrian, Iranian, and Russian forces violated it, and battles are continuing. The Imam Hossein, grandson of the Prophet Muhammad, the third imam in Twelver Shi’a and the founder of the Shi’a. He was murdered at the Battle of Karbala, circa 680 CE, by followers of Yazid bin Mu’awiya, founder of the Sunna.